Most investigations of foreign-born migrants emphasize the successful adjustment and settlement of newcomers. Yet suicide, heavy drinking, violence, family separations, and domestic disharmony were but a few of the possible struggles experienced by those who relocated abroad in the nineteenth and twentieth centuries, and were among the chief reasons for committal to an asylum. Significant analysis of this problem, addressing the interconnected issues of migration, ethnicity, and insanity, has to date received little attention from the scholarly community. 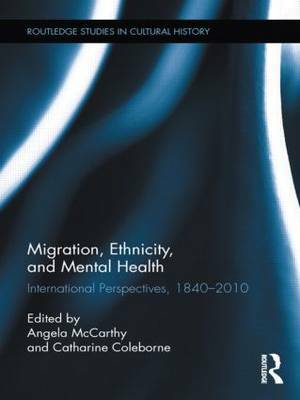 This international collection examines the difficulties that migrants faced in adjustment abroad, through a focus on migrants and mobile peoples, issues of ethnicity, and the impact of migration on the mental health of refugees. It further extends the migration paradigm beyond patients to incorporate the international exchange of medical ideas and institutional practices, and the recruitment of a medical workforce. These issues are explored through case studies which utilize different social and cultural historical methods, but with a shared twin purpose: to uncover the related histories of migration, ethnicity, and mental health, and to extend existing scholarly frameworks and findings in this under-developed field of inquiry.